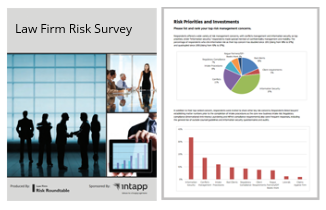 We're pleased to kick off the 2016 Law Firm Risk Survey program. Once again, we're running four separate exercises, inviting risk and IT stakeholders at participating mid-sized and large firms in each of four geographies – US, UK, Canada and Australia. The survey should only take about 30 minutes to complete and participants will receive a copy of the final results. The report will provide valuable insight into industry trends, top firm concerns, and how organizations are evolving risk response strategies in response to a number of factors. If you haven't yet received a direct invitation and would like to participate, please email: info@riskroundtable.com.